On your screen, a yellow box will appear on top of the card! Shooting – Can you find the perfect shot? Sometimes even the surface moves! But where is the hidden target? 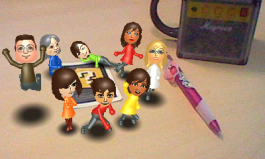 Mii Pics – Little Mii characters everywhere! In this game, small Mii characters will appear in front of you. You can take 3D pictures as if your Mii was part of the real world. 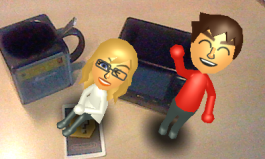 Sometimes they'll sit down on a book or a tiny Mii will look up at you and pose. You can change their expressions and take pictures as if they were sitting in your hand! Lots of Mii characters are ready to pose for you. Try resizing your Mii for a different impression! Cut around the AR Cards by following the broken line. Be sure to print the AR Cards using a colour printer. Use paper with a matt rather than glossy surface to print the AR Cards. If the paper becomes crinkled or folded, it could affect camera detection, so thick paper is recommended. It is best to use an inkjet printer to print the AR Cards. These cards are for individual use. Unauthorised reproduction is not permitted.